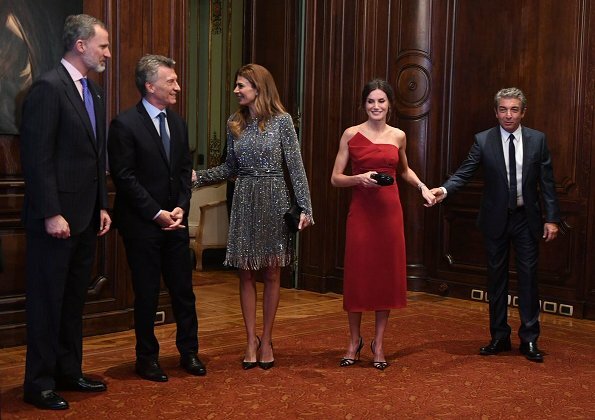 In the evening of the second day of their state visit to Argentina, King Felipe VI and Queen Letizia of Spain hosted a traditional reception at Four Seasons Hotel in Buenos Aires in honour of President of Argentina Mauricio Macri and First Lady Juliana Awada. (The Queen wore a new dress by Roberto Torretta at the reception). 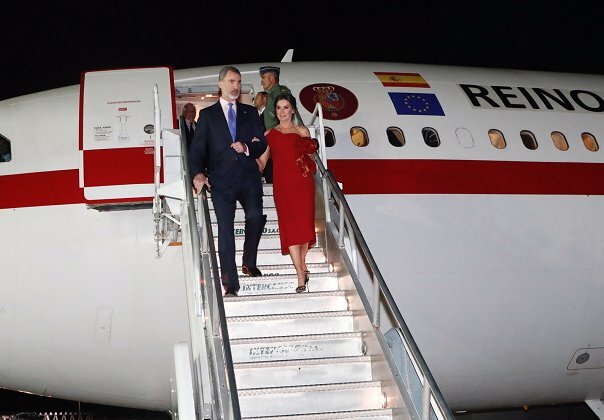 After the reception, The King and Queen of Spain departed from Buenos Aires to attend the 8th International Congress of Spanish Language held at Cordoba on March 27. Letizia! Sie ist hier die Gewinnerin für mich. Ein wahnsinnig schönes Kleid (von Delpozo?). Und das erste Mal, dass mir eine Outfit von Juliana weniger gut gefällt, als das von Letizia. Ich glaube, es die Länge des Kleides. Es hätte knieumspielend sein müssen. She can't go wrong with red, this beautiful dress was originally midnight blue, but Torretta ( Spanish couture, but originally born in Argentina) made the color change for her, perfect cut, length and the semi-bow it's just ideal. The Manolos are just yummy, and the Bottega minaudiere is a classic. Perfect from head to toe. I don't love Juliana's dress, maybe because these 20's inspired dresses aren't my thing, but once again this woman can wear anything and still look good, she is effortlessly stylish. The yummiest thing in all of the pictures is King Felipe! In fact Roberto Torretta lives in Spain since 1972 and his fashion is considered "made in Spain". I much prefer Juliana's dress. Letizia's is too much for the occasion, especially since they were traveling elsewhere after it in the sane clothes. Letizia does never change their clothes into a plane. Not too much!! 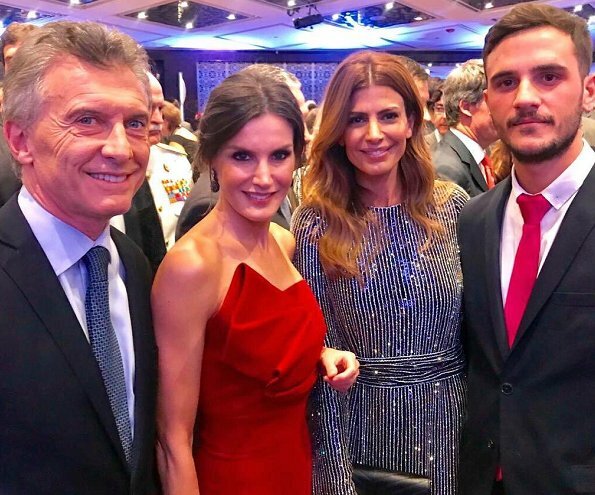 The occasion was the most important for Spain.actually.There were there very important people, actors, etc...Argentinians and Spanish. 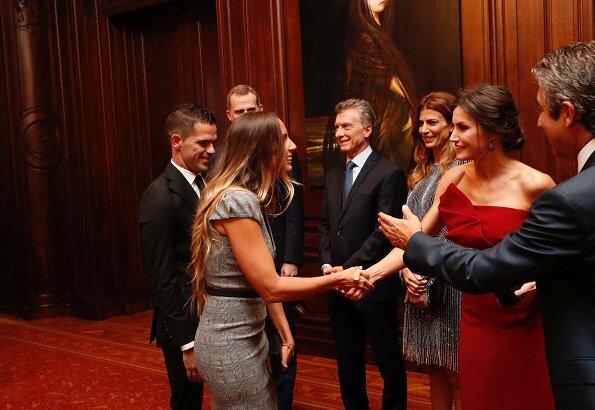 This was the most important meeting in Buenos Aires. They have to do this all the time, it is their life. 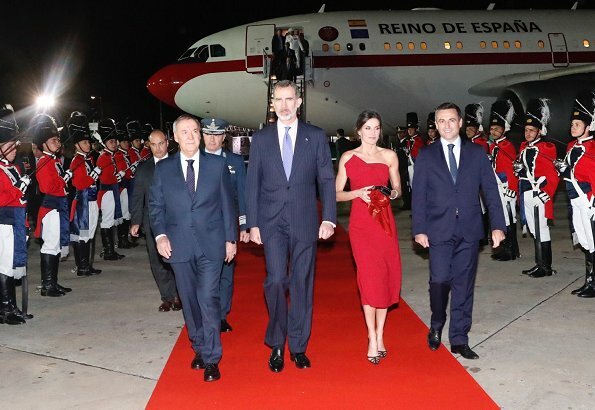 Amazing, I'm in love by this look... Letizia looks great with the red dress, perfect length, adjust to her figure and amazing color in her. I also like Juliana dress, its nice but would prefer to see it as evening gown and as so much more larger. 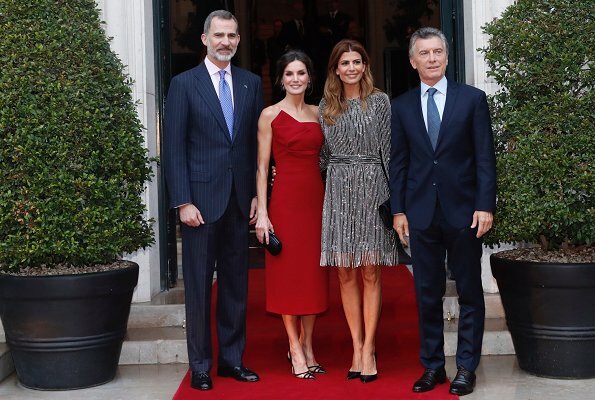 Not evening gown because protocol was "cocktail"...Argentina is not a Monarchy. 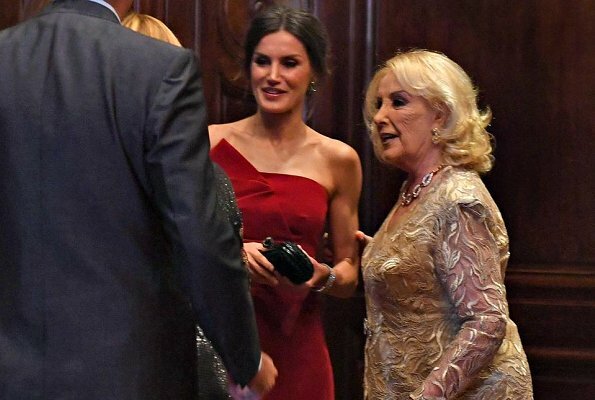 ¿Qué tiene que ver ser Monarquía o República para el dress code? 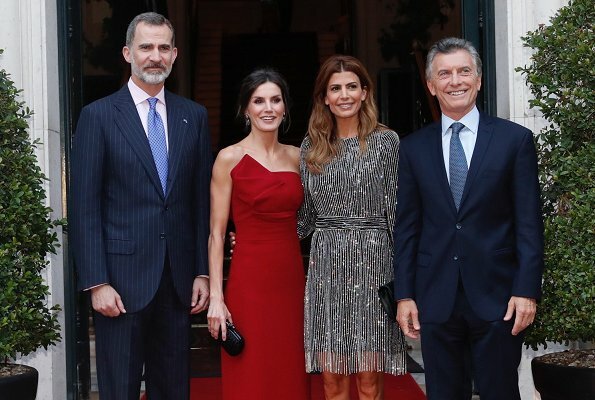 Portugal o Italia son Repúblicas pero en las Cenas de Gala se exige white tie para los caballeros y vestido largo para las damas. As somebody already said, Juliana is incredible! Effortlessly stylish!! Letizia is good, the color and the dress are beautiful!! Now this is a Wow factor for Letizia, this red dress is stunning. 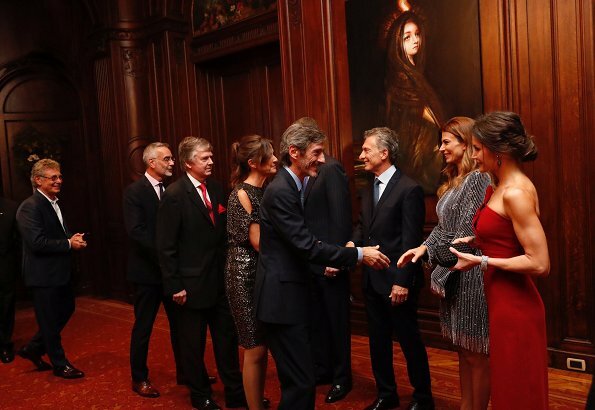 Also like the silver one from the Argentinian First Lady. Great job. Letizia in red! You just know everything is going to be alright. This dress is a stunner--color, cut, fit, and just thr right amount of detail. As for Juliana, I have thought each of her dresses has been too long, until now. This one needed a little length. I think it looked unbalanced with the higher neckline and long sleeves, plus the heavy beadwork, then a short hemline. Anonymous at 8:52pm; My english it´s not perfect, sorry for any mistake, I know that Argentina is not a Monarchy nad that this was a cooktail and nothing else, but what I meant to say is that i like Juliana dress but I would prefer to see that exactly dress a bit larger to be use as a evening gown in other event.